The sixteenth hole is a long par 4 with trees along the left and a large fairway bunker on the right. 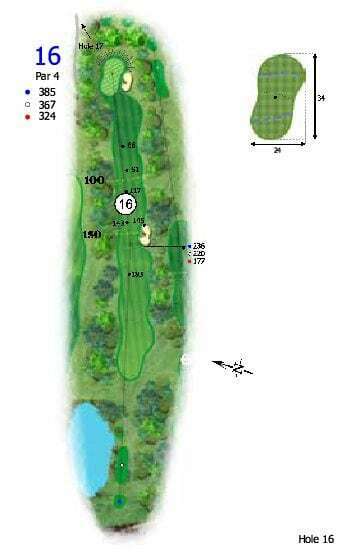 You will have a mid to long iron left into a narrow undulating green guarded by a bunker to the right and a grass hollows to the left. With the green sloping away from the right hand bunker, make sure you hit the green on Emerald Lakes toughest golf hole. Safe Play: Play towards the right side of the fairway when teeing off to give yourself a good line in for your approach shot. Play a long to middle iron for your second shot to the left centre of the green and two putt for par. Aggressive Play: With a very accurate driver straight down the fairway you will be left with only a mid to short iron into a narrow green.